Induced pluripotent stem cells derived from epithelial cells are not adult stem cells, but rather reprogrammed epithelial cells with pluripotent capabilities using genetic reprogramming with protein transcription factors. Pluripotent stem cells equivalent to embryonic stem cells have been derived from human adult skin tissue. Reprogrammed human skin cells have behaved almost exactly like embryonic stem cells. They return the cell to an embryonic-like state. Requires use of a gene-altered virus. Scientists had to use potentially dangerous viruses to introduced the four genes into the mouse cells. Researchers are now trying to find a benign virus and there are four ways being developed to do this. These cells are derived from parthenogenetic blastocytes. This technique creates immune-matching cells to common immune types for transplantation, thereby reducing the chance of transplant rejection among a large segment of the population. It gives all three embryonic germ layers. Because they are created from unfertilized human eggs, they do not require the destruction of human embryos. Hematopoietic stem cells are found in bone marrow and give rise to all the blood cell types. Adult stem cells are undifferentiated cells found throughout the body after embryonic development that divide to replenish dying cells and to regenerate damaged tissue. Also known as “somatic stem cells”, they can be found in children as well as adults. Unlike embryonic stem cells, the use of adult stem cells for research and therapy is not controversial, because production of the adult stem cell does not require the creation or destruction of an embryo. Unlike embryonic stem cells, the adult stem cells are often restricted to certain lineages. Adult stem cell treatments have been used for many years to treat successfully leukemia and related bone/blood cancers through bone marrow transplants. – Does it function like a human retina? We have now, because of social ramifications with human fetal tissue and human embryonic cells, broadened our efforts to include induced pluripotent stem cell research. Human somatic cells are being genetically reprogrammed by episomal methods to become induced pluripotent stem cells (iPSC). These have been modulated to become retinal pigment epithelial cells and neural cells. These cells will be put together in layers on a collagen matrix and will then resemble the fetal tissue that we successfully transplanted into humans. 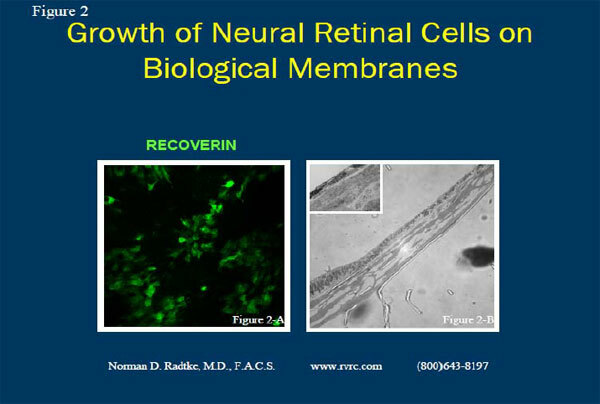 Figure 1 demonstrates the retinal pigment epithelial cells that were derived from the iPSC’s that are growing successfully on a scaffolding, which is a collagen acellular matrix that is biocompatible with the cells and biodegradable. The retinal pigment epithelial cells are shown in Figure 1-A (4x magnification of a light microscopy) covering the membrane. On the right (Figure 1-B) is a transmission electron microscopic photograph of the retinal pigment epithelial cells on top of the membrane. The nucleus, the microvilli, and basement membrane of the retinal pigment epithelial overlie the membrane, which is visible beneath the retinal pigment epithelial cells. The lower left, center, and lower right (Figure 1-C, D, and E) show immunohistochemistry of this retinal pigment epithelial cell layer, which demonstrates its cellular viability and collagen components. 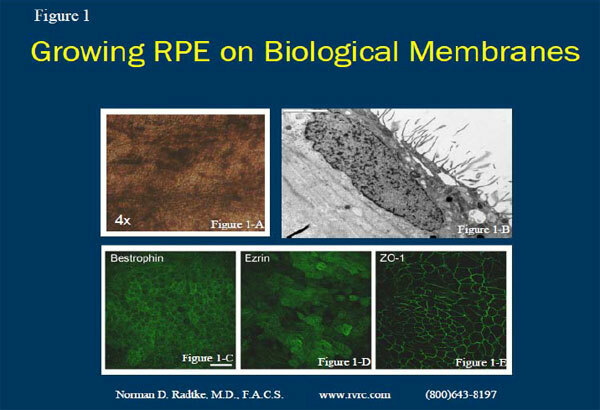 In summary, Figure 1 shows that the retinal pigment epithelial cells derived from the iPSC’s cover the membrane and are viable. Figure 2 demonstrates photoreceptors growing on the membrane. On the left (Figure 2-A) is the immunohistochemistry staining of the nuclei of the photoreceptors with Recoverin, showing that they are viable. The transmission electron microscopy on the right (Figure 2-B) shows layered photoreceptors to the left and single-layers photoreceptors over the remaining four-fifths of the photograph, which is lying on top of the membrane. The photograph shows good coverage over the membrane. The areas in the membrane that look pulled apart are artifacts of processing of the electron microscopy, not defects in the membrane. These two photographs are the results of the initial steps for our future work to combine both the photoreceptors and the retinal pigment epithelial cells together on top of the collagen membrane. The next step will be to transplant this layered sheet of retinal pigment epithelial cells and photoreceptors into rats and to eventually progress to FDA approval to be used in human trials. This effort is to replicate the fetal tissue for transplantation that has been shown to be successful in our previous work in humans with dry macular degeneration and retinitis pigmentosa. This type of cell-based therapy with sheets of tissue may eventually be useful in regenerative medical therapy for dry age-related macular degeneration, retinitis pigmentosa, Stargardt’s disease, rod-code dystrophy, choroideremia, gyrate atrophy, and other retinal dystrophies. This research is being done in collaboration with David Gamm, M.D., Ph.D. at the University of Wisconsin – Madison.